They are suitable for every kind of mixed or mass production.Our plants are designed to satisfy every demand, with a high flexibility that characterizes them and makes every plant unique. 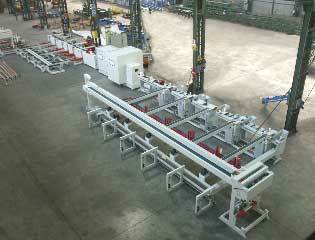 Our aluminium extrusion packing lines increase your productivity, reliability resulting in your customer's satisfaction. The automatic bridge crane moves every sq.meter of your plant and carries the skips in an safe, efficient way. From extrusion line to the packing line, from packing to the warehouse, extruded profiles in skips are handled in the plant with high level of security, programming speed and flexibility. It is endowed with sophisticated hardware and software devices. It can be interfaced with other managing users, keeping the product always traceable during all its run. - lifting speed: 20/30 m/min. Structures having different dimensions, capacities and speeds can be realized in order to satisfy the customer's needs. The stacker machine takes extrusions cut by the finish saw at the end of extrusion press, and load them into the skips (baskets), with proper listels (spacers), by positioning them on guide (one layer leaning on the other) or on a comb (every layer is leaning on proper supports without any contact between the layers). The machine is endowed with a mechanical hand for the withdrawing of the spacers from the container, which, by some conveyors, distributes them in fixed positions according to the length of the profiles. The stacker machine can be inserted on conveyors that are already existing or it can be provided with the saw exit roller, with the respective abutting ends for the measure cutting and conveyors for the measure formation of the layer that you have to stack. It is interfaced with the skip transport system. It allows the change of the same one in automatic, in case it is identified as a full skip, with an empty one. The configurations that we can realize are several and multiple, every plant is made always meeting the customer's needs, always advising innovating solutions to allow the increase of productivity and the care of the profiles' movement to guarantee the quality. The de-stacker machine withdraws the profiles from the skip, by some listels, depositing the layer of profiles on conveyors and the listels on a proper recovery system. 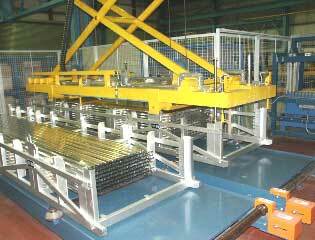 The layer deposited on the conveyors is then conveyed directly to the packing placing or, by some rollers, it is conveyed to more packing placings; in fact, the de-stacker machine can de-stack two skips at the same time serving therefore two packing placings. The listels, instead, are conveyed to a proper mechanical hand that withdraws and deposits them into the container. The hand is interfaced with the skip transportation and allows the change of the skips one completely in automatic. 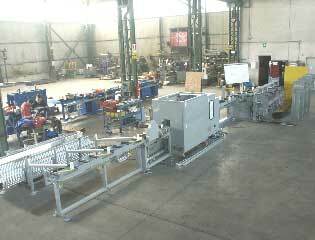 The configurations and the dimensions are made from time to time meeting the needs and the requests of the customer. Skip transport systems for the most various applications; to serve the stacker machines, the de-stacker machines, the automatic bridge cranes, the several packing placings, always respecting our characteristics of flexibility and satisfaction of the customer, we adapt properly every kind of transport. 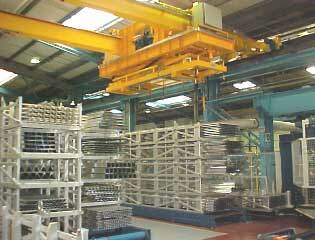 We relize hydraulic lifters actuated by hydraulic jacks. These ones are utilized to keep an ergonomic height of the profiles during the withdrawing of the same ones from the skips, by the operators. They can be utilized as well always to serve the operators during the formation of the bundles in manual mode. The hydraulic lifters are fundamental for all of those operations in which a work position of the operators with regard to the existing regulations of the work ambients must be granted. 6- Bundle formation trolleys "C.F.P.1"
The C.F.P.1 trolleys are really important and indispensable for the manual formation of the bundles, in fact they are used by the operators destined to the manual packing of the profiles into boxes, with inserting, etc. They are endowed with two arms of containment of the bundles during their formation. The arms are adjustable by some screw handwheels, according to the length of the bundle that you want to form. One of the two arms can be pneumatically tipped, this to allow the loading in automatic of the bundle on the rollerway; the containment arm on the work side is adjustable to grant a more ergonomic position of the operators. minimum value the waiting times of the operators. 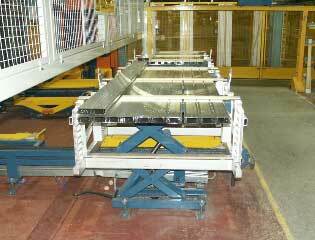 Example of alternative use of our automatic packing lines: the loading table can be equipped with systems for cardboard boxes formation. 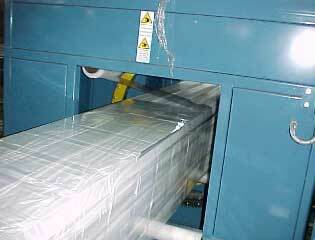 The packing machine can form bundles having dimensions that can be selected by the operators, even of boxes previously formed in the feeling benches and taped by the taping machine. This shows the versatility of our plants, and the importance of our machines in the packing departments, where more types of packing are requested using the same plant. Making of trolley systems for the formation and the transport of bundles formed by profiles having lengths up to 12 metres and weights up to 5000 Kg; they fit for the packing of extruded profiles of big dimensions and high weights. The proper makings are our reference point, we adapt our plants to every situation and exigency that the customer requests us. Example of equipments for the formation and the containment of the boxes in the manual placings, during the packing and the formation of the finished bundle. 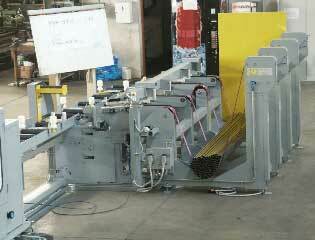 9- Top-loading Taping Machines "C.D.A." The C.D.A.have the function of binding the bundles of profiles that are afterwards conveyed to the automatic packing machines or they are utilized in the formation of bundles in manual mode. These ones allow a binding, with extensible film, in intermediate positions to the length of the profiles, keeping the bundle, which has been formed by the operators, well tight and compact during the several movements. The C.D.A. 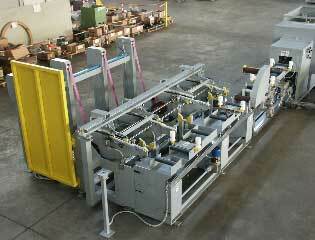 eliminate the manual operation of taping the end of bundle, which are tedious and lavish, in fact the operators only have to position the bundle formed on the position of binding, then the rest of the operations occurs automatically, the withdrawing of the bound bundle included and the following conveyance to the automatic packing lines. -Elimination of the times of binding by the operators. -Easiness of the loading of the reel. 10-Stretch nylon paper dispenser type "S.P.F.1"
The stretch nylon or paper dispenser has the function of preparing paper sheets, plastic material, nylon, to serve the operators destined to packing. The stretch-paper machine in fact, can be placed on the feeding bench of the automatic packing machines; near the trolleys for the manual formation of the bundles in boxes and not; to serve the welding benches. 11- Stretch Paper Machine on Packing Machine "S.F.S.1"
Machine to interpose, in automatic, a protective sheet (paper, polythene, etc,) among the layers of profiles during the formation of the bundle. 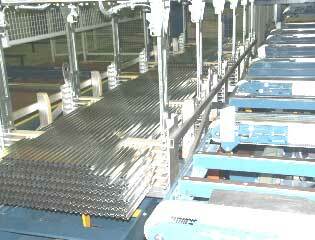 This machine is formed by a bridge structure and it is placed above the packing machine. The reel-holder trolley translates on a guide and positions itself depending on the length of the profile. A system of control of the tension of the sheet, grants a perfect stretching of the same one. - Interposition of the sheet among the several layers in automatic without the need of the operator's intervention. - Width 800mm (variable according to the necessities). 12- Bundle wrapping machine "F.P.1"
The F.P.1 permits the wrapping in continuous of the bundles previously formed by the packing machine or manually by the operators. The wrapping of the bundles is an added protection to the profiles, a more compact keeping of the bundle. During the wrapping of the bundle some wrappings can be realized, with steady progressing, to allow to bring more packing material to those points in which it will be taken by the bridge crane or by the fork lift trucks; this permits to have some protective material to guarantee the withdrawn profiles. 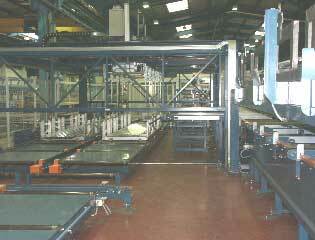 The machine carries out the wrapping with extensible film; on request wrapping machines are made that use normal nylon, they are equipped with a further system of taping of the ends. The F.P.1 is endowed with a device of automatic cutting at the end of the bundle and with a pliers of keeping of the reel's edge; like our other wrapping machines it is endowed with a control system of breaking or exhaustion of the packing material. - Added protection to the bundles. - Possibility of intermediate wrappings in automatic depending on the bundles' length. The bundle formed by the several packing placings is conveyed to the strapping line, this one can be made of polyester or steel, always inserting around the bundle some wooden listels. To ease the operations of insertion of the woods around the bundle, we make blocking systems of the same ones; in fact the bundle is measured by an electronic system, depending on the length it is calculated the number of woods to insert and as a consequence the stop in the strapping positions. At this point the operator can proceed with the insertion of the woods in the proper wood-blocker. The strapped bundle is then conveyed directly to the warehouses. In the strapping lines you can insert weighing systems of the bundles, both before and after the strapping of the woods; the weighing systems can be interfaced with print systems, with PCs, or directly with the company's net. Systems of translation of the bundles are realized, for the conveyance of the same ones to warehouse. These ones are realized with different configurations always to meet the various exigencies of the customer. 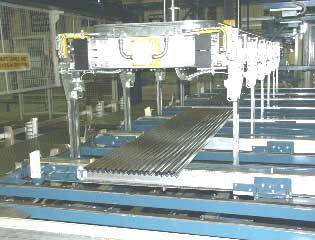 We manufacture special packing lines, not only for aluminium profiles; in the photo it is represented a plant for the packing of chromium plated tubes; in this case for example a bundle of rods is formed that makes an hexagon and then it is conveyed to the wrapping machine and to the taping machine.It is our peculiarity to manufacture special plants that can satisfy every customer's need. We are always at disposal to value and to study new exigencies. 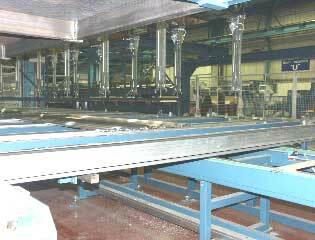 We make packing lines for rectified round bars; in the photo it is represented an unloading bench for two rectifications with direct conveyance to the wrapping machine and to the taping machine for the packing of every single bar or in small bands for bars having a small diameter. The configuration and the making for these kinds of packing is always studied in order to satisfy the customer's needs. 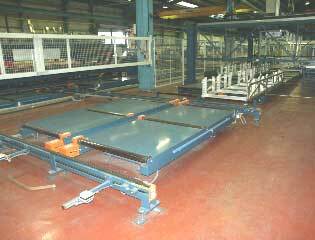 The Carousel can handle 20 skips, and helps preparing an order of different profiles of smaller quantity in a fast and efficient way. The operator calls the number of the skip in the Carousel containing the required profile and prepares the order for delivery. With computer system all data derived from the production, packing, warehouse and carousel are processed and effciency resulting fast delivery and customer satisfaction.